There is a natural selection in motorcycling. Consider the kickstart lever of the 850 Norton. Some nine inches in length the lever demands real muscle or weigh to swing it through its arc. Those who can' drop the lever down smartly, or those who don't want to learn, or those who don' want to he bothered—they all will pass less formidable motorcycles. It's a peculiar process of natural selection. Under achievers may want a Norton, but find themselves unequal to the starting task You may choose it, but bikes like the Norton must also choose you. Understand that the Norton 850 is al elitist's motorcycle. For he who had learned the drill, the Norton will rumble into life with a single well-coordinated swipe. The Norton man shrugs off effete electric starters and invites his quarrel some friends to demonstrate their expertise at the lever. Most likely they'll turn pasty under a nice moist sheen of perspiration without bringing the engine to life. There's a secret. Being a good Norton man is like being a magician: the magic is a few well-rehearsed drills. Learn the routine and proceed to center stage. The John Player Special is the most elite Norton of all, and it takes a little extra knowledge, like the ignition key trick. The starting procedure begins at first with a frustrating attempt to insert the ignition key into its slot. The standard Norton switch nearly fouls the trailing edge of the fiberglass cowling. You can't see the slot which is protected by a rubber cover, and initially you can't quite remember which way the key's toothing should point. But after you've fumbled your way through a few times, you learn the trick. You know where the slot is, and how to hold the ignition key in your left hand between your thumb, index and middle fingers. The key slips right in. You can do it—because you must do it—blind. Of course it's a dumb place to have the switch. But when did you see a magician with all his cards up front? Tickle the 32mm Amals carefully. One must top up the float chambers without gushing them over. Fold the right footpeg up. The kickstarter moves the Norton's two 77mm pistons slowly through their 89mm strokes. Bring the engine up past compression on one cylinder. Use the clutch to free the kickstart lever and position the cranking arm at 10:30. With the bike on its centerstand (or on its wheels, if you're the confident type) smoothly rise up, roll your weight over on your right leg, lock your knee, roll your eyes to heaven and drop the lever down. Unless the engine is hot, the lever won't exactly plummet. On a chill day, when the oil is thick and the engine cold, the kickstarter descends more with an ooze than a swish. On such occasions use the choke and count on three or four cranks. When the Norton's warm, one stab will suffice. It's all in the sorcerer's handbook. The John Player Norton has a certain illusionary character. It's the namesake of the Norton factory bikes which race under the banner of the John Player Tobacco Company. What's in a namesake? Not a production-racer replica of anything, the Player bike is a standard Commando dressed up in race-track clothes. The outfit has come from the same tailors who created the John Player Norton F750 racers, so the style and cut follow an intentional pattern. The upper part of the JPS fairing mocks the F750 racer, though the street Player has two huge eye sockets for headlamps. 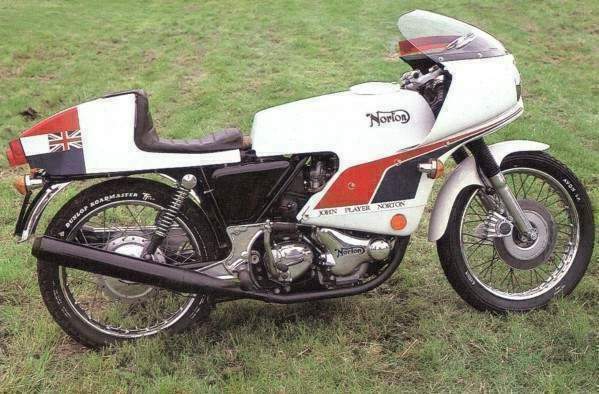 The street fairing is a three-quarters midi, a style which no doubt will become fashionable just as soon as the back-street entrepreneurs begin to build molds off the Norton's Avon fiberglass. To complete the racer-image, the JPS sports a high-back monoposto seat, clip-ons, rear sets, black exhaust system, and a tank canopy. Tank canopy? Yes, the real steel gas tank hides under the spreading fiberglass cover. At its lower reaches the canopy-cowling flares out and meets the fairing, connecting up with four Dzus fasteners on each side. 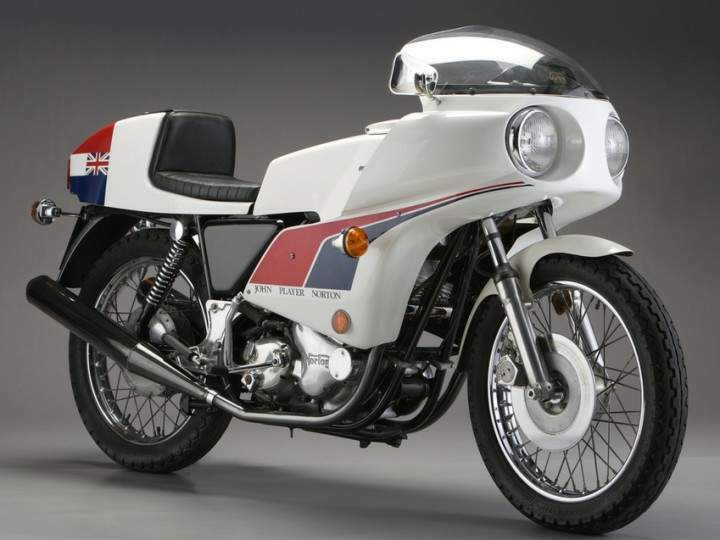 Fiberglass tanks are now illegal for road-going motorcycles in England. Nevertheless, Norton didn't want the JPS bike to lose its racer-image, hence the thin fiberglass canopy over a steel gas tank. Does it offend your sense of race-crafting? Where, you might ask, is a strictly functional lightweight aluminum gas tank? Where indeed. Most likely such an idea got trapped at a deadly juncture—between two sheets in a cost accountant's ledger. So the JPS's racer-looks are literally gel-coat deep. Hmmmm, you ask, if the bike has no more poke than the standard 850, and if it's just another pretty fiberglass face hung on a dear old girl. is the John Player deal all a steam-blowing shuck? Quite to the contrary. The street Player is refreshingly and beguilingly honest. No one at Norton is shouting "production racer." Nobody is claiming that you'll get a piece of Peter Williams, or a section of Parliament Square, or even an odd chunk of the Isle of Man. The JPS has no extra power, no special speed, no monocoque frame, no trick gearbox. It's zip-zero-zip for a straight-up reason. The basic 850 Norton Commando is the end product of a British system of development and refinement. That means the basic Commando is both the factory's best, and only, Norton. 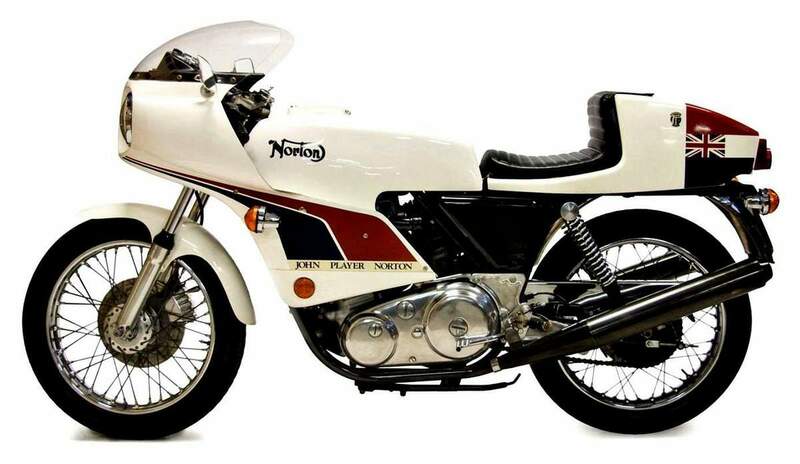 If the John Player Café-racer had trick ignition, a special gearbox, high-compression pistons, and high-rpm camshaft (specialitis ad nauseum ergo undo), Norton would be selling something considerably less than its best motorcycle. Better that Norton's Café customers have flashy John Player glasswork and a good Commando than flashy John Player glasswork and a basket of incipient shrapnel under the cowling. Lift off the tank cowling and you'll find a modified Commando Roadster gas tank with foam rubber squares gracing its surface at strategic points. The treatment prevents the shroud from rattling about on the steel tank. This vessel, which even a polite Anglophile would label "cobby," holds 3.2 gallons. That's a bit more than the standard Commando Roadster (3.0 gallons) and far less generous than the Interstate Commando (6 gallons). The JPS shows some rearranging immediately behind the engine. There's a new air filter box, a large molded plastic container with air intake scoops on the bottom and a wet foam filter inside. The new airbox really hushes down the intake noise of the big vertical twin. The larger airbox has forced other components behind the engine into another formation. The battery on the Café-racer has been rotated 90 degrees so that it mounts transversely (that is, the long sides of the battery go across the bike). The new intake plumbing is part of the so-called Mark 2A sound-control system. The 2A specification also includes giant mufflers. Although the ends of the silencers appear to be sealed, the exhaust actually escapes around the circumferences of the end plugs. The 2A hardware has already been marketed in Europe where Germany and Sweden have the toughest noise-control laws. The whispering John Player bike sneaked past Cycle's decibel meter with an 80 db (A) reading. Credit for the new-found silence is shared by the effective intake and exhaust systems and by the fairing and cowling which contain upper-end engine noise. The seat has normal padding by Café-racer standards. Judged on a touring scale, the seat would get high marks for misery. Two snaps at the top of the tail section permit access to the compartment behind the padding. This must be Norton's version of the Yamaha Cycle Camper—there's an enormous amount of room. Up front the Avon midi-fairing dominates the motorcycle with its two six-inch headlamps. 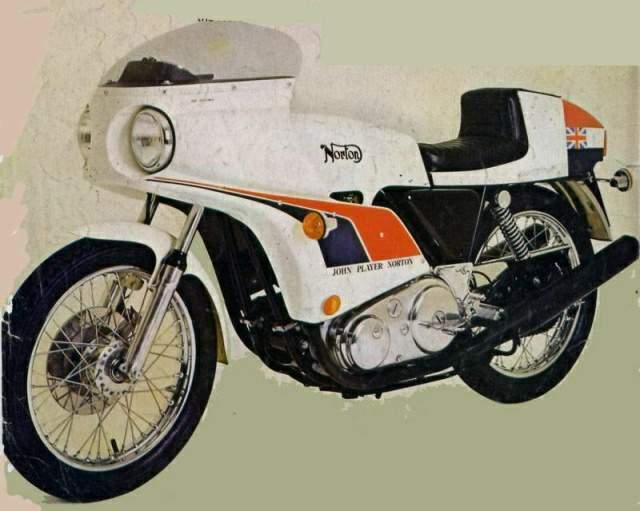 In order to provide sufficient energy for the dual lamps, Norton has fitted the JPS with a high-output alternator. In certain cases, the double headlights work better than the best single lamps. For example, the double lights are excellent for straight-line Interstate driving. But for night-time riding on winding roads, they're not significantly better than the Kawasaki's Z-1 headlight. Above and behind the headlights, the fairing has a handsome instrument deck which carries the tachometer, speedometer (which strangely lacks a tripmeter) and the indicator lights for ignition, signals and high beam. The fairing interior and deck are finished in a matte black. Customers better love the way the John Player bike looks, because the fairing (though attached by a U-bolt. bracket, and stays) is an • integral part of the bike's concept. One can't just subtract the fairing and find ready solutions for instrument and headlight remounting. And without the fairing, the tank cowling would have no anchors. Dispensable the midi isn't—but vulnerable it is. Street Player owners will undoubtedly exercise some riding caution just to protect the beautiful lightweight Avon fiberglass. We would advise care. During a photo session, we propped the JPS away from a wall of background paper with a 12-inch ruler. The ruler slipped out of place and the bike fell against the wall. The thin fiberglass surrounding the clip-ons fortunately distorted on impact and did not break. In fact, the blow didn't put any cracks in the gel-coat of the glass. However, the right-side mirror, which bolts directly into the fairing, punched a hole through the glass around the mirror's mounting boss. You can't have a fiberglass fairing which is light and resiliant (within limits) and still highly resistant to pinpoint blows. The Player Norton fairing will absorb minor blunted assaults which would crack thick fiberglass. But in any real sky/ground/Dear Lord/sky/ground episode, no fiberglass is tough or resilient enough to survive intact. A street Player will likely endure a minor fracas in its garage. But if you ditch it with enthusiasm somewhere, draw your money-gun and start shooting. Minor surface scratches in the color-impregnated gel-coats can be rubbed out with a careful balance of elbow grease and polishing compound. You'll not be running off to your local hardware store for touch-up paint. The red and blue stripes aren't paint either: the colors are pre-cut sections of pressure-sensitive tape. Ditto for the seat decor. There's good reason for using tape. Most paint dries very brittle, and it would flake and crack off the fiberglass surfaces of the bike. Any cracks in the gel-coat surface show up more in light colors than dark ones. Some cracking developed in the tank cowling which is so thin and lightweight (five pounds) that it's very bendable. Nevertheless, the Avon glasswork is almost flawless; it's in a different league from most other factory-supplied fiberglass which we've seen. By comparison, Italian glass looks like it was laid up in a brown paper bag. For short periods the Norton engine reminds its rider that he's aboard a big displacement vertical twin. The Isolastic system allows the 850 engine to shake the entire motorcycle below 2500 rpm. The shaking ranges from very little to severe. At 1800 rpm, for example, the engine vibration reaches exactly the correct amplitude and frequency to rattle the JPS with amazing ferocity, and white fiberglass becomes a ghostly blur. 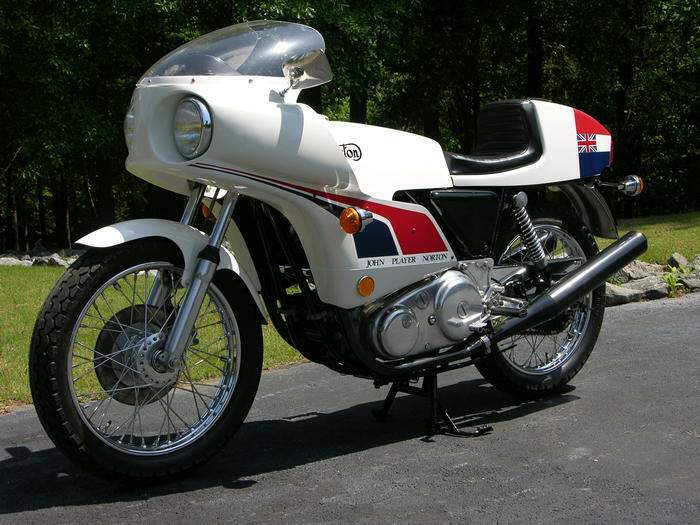 The street Player did not quake so fiercely as the 850 Commando which Cycle tested in July 1973. That bike had a set of round-town troubles. When it was set up to idle nicely, the 1973 bike would stagger and stall off-idle. To eliminate stalling, the Amal curbs were calibrated for an unhappy 1200-rpm idle. To avoid the shaking range on the 1973 bike (idle to 3000 rpm), staffers used second gear in fast city-type traffic where muffler noise proved embarrassingly loud. The Player Norton is a real turn-about. It becomes smooth at 2500 rpm. Thus the JPS has a broader, more useable power-band. The Player is geared a little shorter than earlier 850s (20-tooth gearbox sprocket instead of 21- or 22-cogs), making both second and third gears workable for 30-45 mph city traffic. And the JPS had the best Amal carburetors that Cycle has tried in a long time. Norton now uses its own special carb needles. The engine chugs softly at its idle speed of 900 rpm. Sometimes there's a tiny hint of a glitch and a fleeting trace of hesitation right off idle, but compared to other Amals the set on the JPS was a near revelation. Kick-starting at the stoplight, like rowdy Norton mufflers, appears to be history. In city traffic, the JPS behaved as unobtrusively as Casper the Ghost. On the open road, the Norton's silence remains impressive. The bike almost radiates a BMW R90S character. In part the silence creates that impression, but it's also in the easy gait of the engine, the torquey punch which a throttle roll-on produces, and the remarkable smoothness above 2500 rpm. The Isolastic buffer system allows the engine—and transmission and swinging arm—to vibrate in a sub-section isolated from the rider and the main running gear. At some intervals up the rpm band, such as 3000 rpm, the rider can feel some faint trembling through the footpegs and seat, but nothing severe enough to call bothersome. Furthermore, as the brand new (and tight) 850 engine bedded in. the exact rpm-points of the tremors shifted around a bit. Hooking down a winding road is probably the most pleasant thing you can do with the JPS. Assuming you're willing to lean on the 55-mph limit, and assuming you haven't picked a knotty road with tight, vicious corners, then you can click the Player into fourth and proceed with a sense of calm grace. The bike feels light and agile and precise, something like a big road-going single. The Norton's agility and the TT100 tires give the rider a confident feeling. The bike suggests that a rider could change his mind in a corner should his line intersect with a suddenly-discovered rock on the road. The Player lacks the cornering clearance for moderate (side- and centerstand left-side) to proper (right-side pipes) heroics. Especially swinging left, you wouldn't want to bore into a corner too hot—and have to crank the bike over harder to stay on the road. In that situation you might have to trust both the macadam and dirt capabilities of TT100 Dunlops. JPS owners should do themselves a favor: remove the whole sidestand assembly and file off a corner of the centerstand. That still leaves the pipes, but most riders might well be approaching the tape-and-bandage state of public highway riding when they start grinding flat spots in the pipes and mufflers. Café racers are never really comfortable: there are simply levels of pain or its absence. Riding positions are particularly critical. Dimensions that fall an inch short, for example, may spoil a touring machine's riding comfort while an inch's error can make a Café racer all but unbearable. Furthermore, what fits a rider who is five-ten and 160 pounds may put a six-foot 185-pound rider in sheer agony. Even two people who are the same height and weight may disagree about the "bearability" of the same motorcycle. Differences in arm, leg and torso measurements can result in far different judgments about comfort. Anyone who buys a Café racer should expect to do some individual tailoring. Cycle's larger staffers felt both stretched and cramped on the JPS. The bars were too far from the saddle, and the stretch produced sore arm and neck muscles after an hour in the saddle. Most American riders would probably welcome clip-ons which could he located about three inches higher and two inches rearward from their present position. As the JPS bars pulled riders forward, the footpegs seemed too far hack. Larger riders started to hang their boots on the pegs by the heels. This, in turn, dropped the toes down too far for brisk riding. In a series of corners the boots had to be pulled hack on the pegs and up Out of the way. Big feet combined with the gearshift lever to create an awkWard situation for some riders in right-hand corners. With the JPS clicked over hard to the right, the gearshift lever is so close to the pavement that a big foot can't get under the lever to change up a gear. What's worse, you could get a size-13 toe caught between the road and the lever, and that shocking experience is guaranteed to widen your line through any righthander. The Norton's hand controls remain as before: wing switches for the high-low beam and the directional signals, and a half-turn throttle which should be a quarter-turn one. As always, the clutch pull is light, thanks to the diaphragm-spring clutch. And the Lockheed disc brake has a firm, progressive feel at the lever which translates into a lot of stopping power with the Dunlop TT 100 front tire. Two staffers complained that the front brake lever started working too soon—the lever hadn't arced hack sufficiently for some riders to get a grip strong enough for a tire-howling stop from high speed. Big-handed staffers scarcely noticed the problem. Yet in this age of disc brakes, there's little reason for brake levers to be positioned as far away from the handgrip as the clutch lever, unless manufacturers find symmetry a compelling argument. Down in the foot department, the four-speed Norton transmission, once loosened up, confirmed again the Norton gearbox reputation. It's notchy enough so that you never have to struggle to find neutral, but the lever never resists the foot. Its throw is both short and positive. The Norton gear changer, like Italian ones, retains mechanical feel. You know up-shifts and downshifts are mechanically actuated. But most Italian bikes have longer throws than the Norton. Japanese changers have short throws; though compared to the Norton. Japanese levers generally have a hydraulic feel. In its first thousand miles, the Norton belied its reputation in one respect. Thrashing the bike down a winding road, the gearbox would momentarily get lost in the four-three downchange. The shift would go through, but it was still disconcerting. Our test machine was built before September 1, 1974, so right-side shifting was retained. In compliance with U.S. requirements, machines built after September I. 1974 for sale in the United States must have left-side shifting and right-side braking. We hope the Norton gearbox loses none of its shifting feel and crispness in the changeover. The rear brake has little to lose in the change. Thanks to- the leverages, there's not much braking force available at your left foot. Enough perhaps to keep the bike steady, but that's about all. Shoes and boots kept knocking the lead wires out of the stoplight switch terminals. The footwear would scuff on the exposed switch, and this, together with engine vibration, was enough to disconnect the leads. JPS owners should wrap the switch securely in black electrical tape. The Cycle staffers (and hangers-on) divided on the Player's appearance. One allowed that the bike looked like a frog which had been tire-creased on .a Texas highway. Others thought the JPS looked fabulous from certain angles, but lumpy from others. Still others saw the JPS as a bold departure from normal inbred Café-racer patterns. Everyone agreed that the JPS was an eye-catcher—and an expensive one at that. Whether a factory does the building, or some small constructor or the individual enthusiast, specials by their nature are expensive. The JPS wears a POE price of $2995. A standard Commando retails POE for $2500. Some might consider building their own Norton Café-racer, those enthusiasts can fashion a bike to their own individual tastes, though it's still going to he expensive (these days alloy tanks cost $175 a copy). A lavish project could swallow $500 easily. What about other factory-built Café-racers? In California the BMW R90S comes in at $3400-plus: Ducati Super Sports fetch $3500, and that figure won't touch a Laverda 1000 ($3900). The Norton is a $400 notch away from these heavy-spender specials, and that price differential is significant. There are two clip-on sports bikes which share roughly the same price slot as the John Player Special: the Ducati Sport ($2600) and the Moto Guzzi 750 Sport ($2750). Both these machines represent more modern engineering than the Norton. Nevertheless, outside the engine bays, neither Italian bike can match the Norton network for parts and service. Here in the United States, there's just a greater body of knowledge about Nortons, their care. tuning, and idiosyncracies. Remember that Cycle does not consider any Café racer—British. Italian, German or whatever—a "best buy.- Even those who are looking for purely good dollar buys should skip over Café racers, and leave the clip-on runners to someone else. And leave the JPS for someone who knows how to light off a cold 850 twin with one sure kick… who loves an interested and appreciative audience… who complains about scraping pipes and stands with transparent satisfaction… who points smugly to his feathered-in TT100s… who believes that the Norton engine never gets old, just better… who doesn't give a damn about little oil leaks… who will testify that brute horsepower alone makes good brutes and poor motorcycles… and who looks at his JPS and sees Peter Williams in full flight down Bray Hill On a fine June day in 1973.